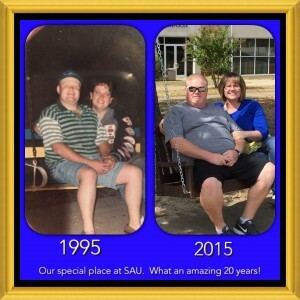 We met through the MBSF program at SAU. Bryan and I were very active in the Missionary Baptist Student Fellowship program on campus. We also attended athletic events together. We would hang out at the MBSF center with all of our friends. Everyone enjoyed playing basketball, video games, ping pong, cooking, and watching TV at the center. We would drive to Texarkana to go out to eat and visit my family. We have been together 23 years including the years we dated. Bryan and I would walk from the MBSF center to the swing that used to hang from the large magnolia tree next to the bell tower. That swing became our special place to sit, talk, and pray together. After nearly a year of dating, we walked to that swing late one evening like we always did, but this time, Bryan got on one knee and asked me to marry him. Needless to say, that swing and spot on campus is very special to us. We always visit that spot when we are on campus.